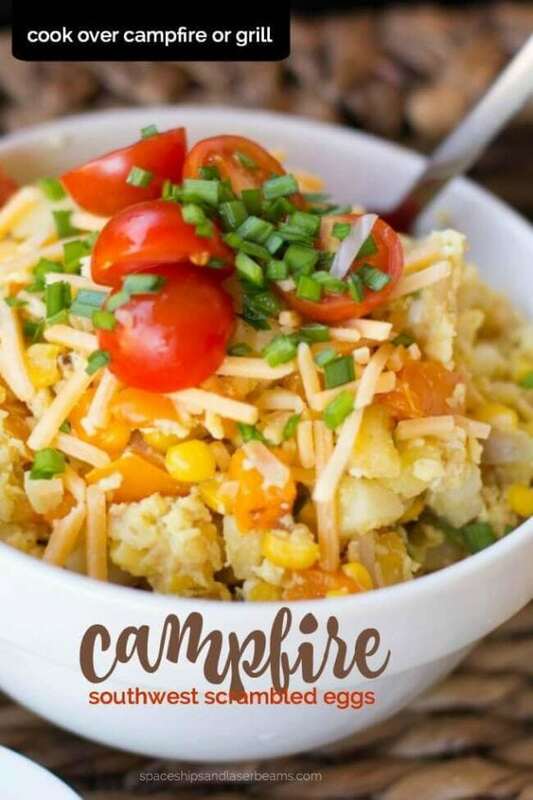 These easy campfire meals are perfect for families looking for recipes they can make camping! 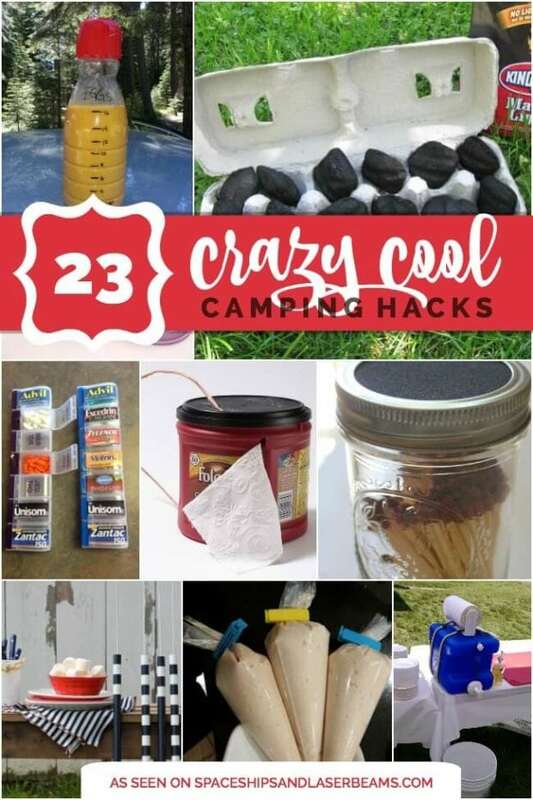 Are you getting ready for a camping trip? These amazing camping/campfire recipes will leave your family full of tasty goodness to go along with the great memories you’ll be creating on your adventure. I am impressed by all the ideas of items to cook over a campfire: french toast, breakfast burgers, cinnamon rolls, potatoes, banana boats, cheesy fries and kabobs. There’s even pizza, eclairs, nachos, quesadillas and monkey bread! With these camping recipes, you’ll feel like you’re enjoying five star meals. Yum! Check out A Boy’s Camping Themed Birthday Party for lots of great camping party ideas. Your outdoor loving boy will love to have a Boy’s Modern Camping Birthday Party. Sure to bring smiles to the entire camping crew, this campfire French toast is easy to prepare. It features an Egg Creations French Toast Blend that comes in a carton and can be frozen ahead for longer camp freshness. Just pour out the egg mixture, dip your bread and cook. You can save cracking the eggs for home. This campfire southwest scrambled eggs recipe also boasts liquid eggs that can be frozen to keep cold until you are ready to use them when camping. Using liquid eggs takes the stress out of transporting whole eggs that can crack. Yummy southwest style ingredients like corn, bell pepper, jalapeno, red onions, cherry tomatoes and southern potato hash give this recipe that southwest flavor. Loaded with bacon, these cheesy Dutch oven potatoes are ideal for cooking over hot coals while camping. So grab your Dutch oven, potatoes, bacon, cheese, onions and salt & pepper and get ready for an amazing side dish while camping. If you don’t mind a few prep from home steps, this potato boat dinner with ham, cheese & bacon makes for a great campfire cooking recipe. To keep campfire cooking simpler, this recipe suggests bringing pre-cooked bacon and potatoes. The rest of the prep is simple. If S’mores are the quintessential campfire dessert, banana boats are their camping dessert cousins. 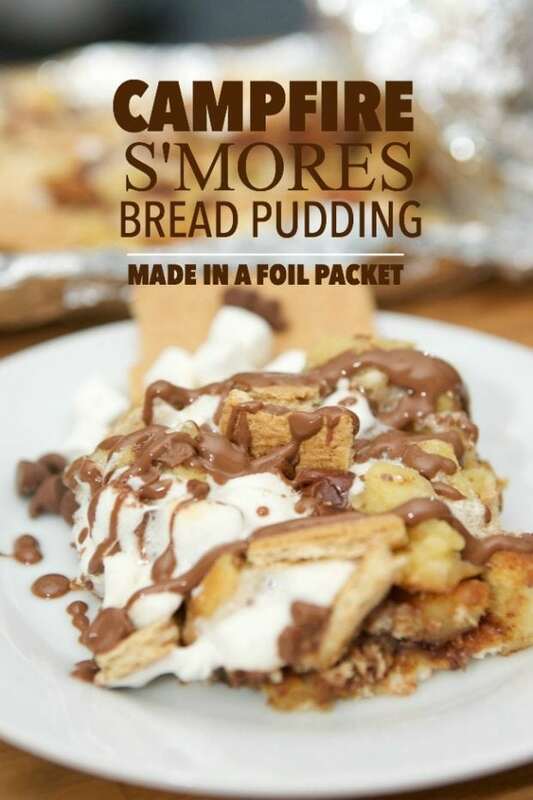 So easy and delicious, all you need is foil, bananas, marshmallows and chocolate chips. Now you can enjoy your favorite cheesy fries and a campfire too! Bring along a bag of your favorite frozen fries, butter, American cheese, some green onion, and pre-cooked bacon bits for some comfort food that can go from frozen to cooked-to-perfection in a flash! You can go camping and eat your veggies too with this healthy veggie and sausage shish kabobs meal idea! Soak skewers in water to prevent burning and cut up veggies and meat prior to departure, if you’d like to spend less time prepping at your campsite. A little olive oil and seasonings, and you are ready for a lovely campfire meal. A tin foil appetizer that you can make while camping? This melted cheese dip is so easy and is prepped in a DIYd tin foil pouch for easy cleanup. You’ll need 2 sheets of tin foil, salsa, tomato, green onion and prepared herb & garlic cream cheese for this tasty appetizer. There are some great shortcuts for making this grilled S’more pizza with snickerdoodle crust! You can use store-bought snickerdoodle dough and caramel sauce. Just top this cookie pizza with the caramel sauce, marshmallows and chocolate chips before heating. The wood smoke of a campfire adds to the flavor of this super-easy one-pan dish perfect for camping. You’ll want a big wok or frying pan for this campfire paella. What makes this campfire S’mores bread pudding recipe so great is its use of liquid whole eggs (lessens the prep and mess), combined with some pantry staples like milk, sugar, vanilla, mini marshmallows, chocolate chips, graham crackers and stale white bread. You’ll love that clean-up is easy using foil packets for cooking. Imagine the surprise of biting into a yummy dessert with layers of pineapple and pound cake, sprinkled with butter, brown sugar, cinnamon and nutmeg topped off with whip cream after being cooked over an open fire! That’s exactly what you’ll get if you whip up this campfire pineapple upside down cake. These chicken cape kabobs can be prepared using any cut of chicken and your vegetables of choice. We’re pretty sure the lemon garlic marinade used for the chicken will be a hit. Be prepared to amaze fellow campers with this recipe for campfire eclairs. Easy and foolproof, this delicious dessert is made using crescent roll dough in a can, chocolate pudding and spray whip cream. Two inch wooden dowels, soaked in water, work best for wrapping the dough around for cooking. This Italian sausage and potato tin foil dinner just requires a little slicing and dicing, but the prep is fairly simple. A sprinkling of olive oil and seasoning later, and your foil dinners are ready to cook on coals for about 30 minutes. If you’re wondering what a lumberjack breakfast is, wonder no more! This hearty campfire recipe is prepared by spraying tin foil with cooking spray and layering sausage, hash browns, eggs, cheese and toppings of your choice prior to cooking in a tin foil packet. In just 15 minutes on the campfire, you’ll have a delicious breakfast. Sometimes called “hobo dinners”, these easy hamburger and veggie tin foil dinners are easy enough for kids to help prepare. Plus, they can be cooked on the coals, right in the tin foil making clean up a cinch. Making campfire pizza nachos is easy with the use of a skillet! Simply layer chips, queso, quartered pepperoni, chopped green pepper, olives and onions in the skillet and sprinkle with cheese. Cook until melted. Fans of Brussel sprouts will love this grilled Brussel sprouts recipe! Sprouts are marinated in a simple mustard sauce for 30 minutes, prior to spearing with skewers and grilling over the fire. Campfire quesadillas are easy to prepare while camping. Ingredients are spread on tortillas, folded and covered in tinfoil prior to grilling. If you love blueberry cobbler, this recipe features store bought buttermilk biscuit dough to quickly make an easy version you are sure to love. Sugar, fresh blueberries, flour and store bought biscuit dough is all you’ll need to grill up this yummy dessert. Everyone needs a sweet, juicy, melt-in-your-mouth dish for their next camping trip. This peach mallows recipe is the one! And in only about 5-6 minutes from start to finish, you can’t go wrong. Just slice a peach in half and follow up with butter, marshmallows and a sprinkle of cinnamon before wrapping in tin foil and cooking over a campfire for 3-5 minutes. Yum! Need an easy go-to, make-ahead recipe for that first night of camping? This easy chicken fajitas recipe is perfect! Just cook up the fajitas, and wrap them in tin foil before you leave for the campsite. Reheat them in a frying pan over the campfire. Bring a little gourmet to the campground with this warm rosemary olives recipe perfect for the campfire. Just toss some olives with fresh rosemary, olive oil, and crushed red pepper on top of some aluminum foil. Carefully fold up the foil into a little cooking pouch and warm over the campfire. There’s nothing better then enjoying delicious french fries smotherd in a piping hot cheese. Combine with green chile for a little kick and you have a perfect campfire treat that is simple to make when braving the elements. French fries are cooked over the campfire wrapped in aluminum foil and served family style. Don’t fix the same-old, same-old for breakfast while camping. Try this foil packet blueberry breakfast bake. The wet ingredients can be prepped ahead and stored in a sealed, travelable container. At breakfast time, simply pour the milk and egg mixture over the cubed bread, gently mixing. Fold in blueberries prior to baking in individual sized tin foil packets. This whole wheat pasta with goat cheese and tomatoes can be cooked over the campfire in individual foil pouches! The noodles are cooked ahead at home, but are easily refreshed over the heat with the addition of tomatoes, fresh basil, garlic, salt and pepper. Once reheated, the pasta is divided into individual foil pouches and topped with a dollop of goat cheese prior to cooking over the fire. Enjoy the deliciousness of a gooey chocolate cake out in the middle of nowhere with this simple and easy recipe for a skilled ice cream cake. Prepared like a traditional, but even better cake, cooked over the roaring fire in a cast iron skillet and topped with scoops of ice cream. This campfire monkey bread starts with a can of baking powder biscuit dough. Some brown sugar, cinnamon and butter later, and you’ve got one classically delicious campfire recipe that you can cook in a Dutch oven or in a skillet over the campfire.